This ultra hydrating balm is treasured for its extraordinary healing quality. It reduces the appearance of wrinkles and fine lines. It has an exceptional ability to assist in the healing of surgical scars. It calms and nourishes inflamed skin. It promotes superior hydration and restores exuberance and vitality to the skin. Face to toes, good for lips & great for burns. For increased protection and the preservation of moisture apply a small amount of this Reparative Healing Balm over face, neck, and body. Apply to desired area and massage in for 1-2 minutes. Allow to absorb. Cold pressed Aleurites moluccanus (Kukui Nut Oil), Butyrospermum parkii (Organic Shea Butter), Organic oils of Prunus armeniaca (Apricot Kernel Oil), Persea americana (Avocado Oil), Oenothera biennis (Evening Primrose), Arnica montana, Calendula officinalis and Tocopherols (Vitamin E Oil), with Pure Essential Oils of Matricaria chamomilla (Chamomile), Delargonium graveloens (Geranium), Lavadula angustfolla (Lavender). Kukui Nut Oil — Cold Pressed - The Kukui nut tree is the official tree of Hawaii, and has been used by the natives of the Island for hundreds of years. Recognized for its soothing properties, the Kukui nut contains very high levels of the essential fatty acids linoleic and alpha-linoleic. It is readily absorbed into the skin, providing tissues the essential elements that are needed for healthy skin. Shea Butter — This organic Shea Butter promotes superior softness. It provides natural protection against UV rays and contains multi-vitamins giving it superior healing properties. Geranium Essential Oil — This oil is originally from Africa, and is exceptional in its ability to heal wounds and/or aging skin, post-surgical skin, or burned skin. It is also excellent for improving circulation and has a sweet, floral essence. 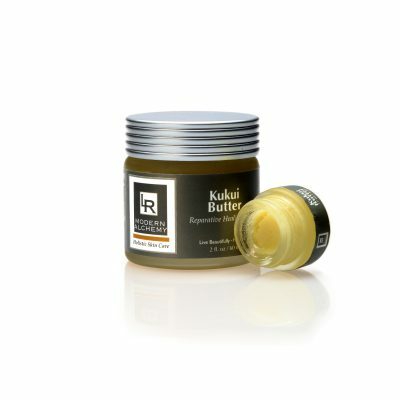 Once I started using the Kukui Butter, I could not imagine not having it as part of my daily skin care arsenal. I live in an arid climate, and it is essential to have the best hydrating skin products. LR Modern’s Kukui Butter is a must! Unlike other skin creams, I feel that Kukui Butter not only coats and protects my skin, it FEEDS it with non-chemical, passionately researched and hand mixed ingredients. I’ve been using it daily on my face, neck and décolletage for seven months and notice a significant improvement in my complexion, which looks healthier and smoother. I don’t see as many lines on my forehead. I’ve also started using it on my lips and in my nostrils to combat the dryness of New Mexico.